What’s Next For Utah’s National Monuments? 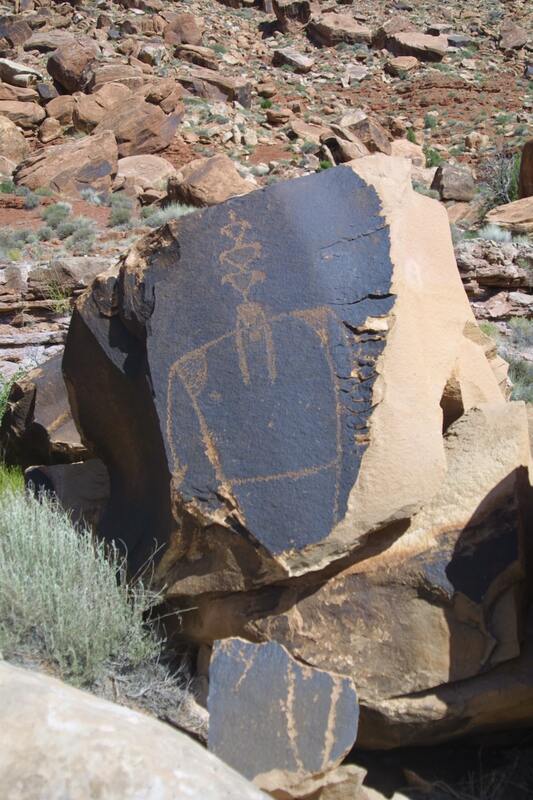 What’s Next For Utah’s Bony Treasures? Back in December, the Trump administration announced reductions to two of Utah’s national monuments: Grand Staircase-Escalante, which runs from the Grand Canyon to Bryce Canyon National Park, and Bears Ears, newly established by the Obama administration just a year before. The reduction opened up nearly 2 million acres of previously protected federal land to fossil fuel and mineral exploitation, angering Native Americans, for whom the land is historically and spiritually significant, as well as environmentalists, archaeologists, and paleontologists. They argue that irreplaceable ecosystems and human and evolutionary history could be lost forever. For those paleontologists, Utah’s federal lands have already yielded new species, and new understandings of the age leading up to dinosaur extinction—as well as a view into the changing lives of mammals over the last 500 years. Meanwhile, some of the sites of those discoveries are now excluded from the safety of the monument’s boundaries. But all these fears remain in limbo. Just this week, it was announced that a group of lawsuits to reverse the cuts would remain in federal court in Washington, D.C., rather than move to Utah, a decision the plaintiffs are celebrating. As the legal process continues, scientists are waiting to see what will happen to the newly excluded acreage, which still contains hundreds of thousands of sites they consider important. Will the Department of the Interior open the land completely to oil and gas extraction? And what specimens—ancient dinosaurs, mammals, fish, and more—could be lost if so? Paleontologists David Polly of the University of Indiana, and Stuart Sumida of California State University, describe the specimens the fossil-rich region has yielded already, and why whole sections of the geological record could be lost if drilling is allowed. Plus, law professor John Ruple explains the legal arguments against cutting the monuments in the first place. Check out some photos from Bears Ears National Monument below. P. David Polly is president of the Society for Vertebrate Paleontology and a professor of Geological Sciences at the University of Indiana at Bloomington. He’s also a Visiting Environmental Scholar at Yale University in New Haven, Connecticut. John Ruple is a professor of Natural Resources Law in the S.J. Quinney College of Law at the University of Utah in Salt Lake City, Utah. Stuart Sumida is a professor of Vertebrate Paleontology at California State University-San Bernardino in San Bernardino, California. IRA FLATOW: This is Science Friday. I’m Ira Flatow. Southern Utah is a treasure trove of fossils. Two national monuments store volumes and volumes– I guess I should really say, layers and layers– of the history of life on Earth, ancient fish, mammalian ancestors, and the latter days of the dinosaur. Much is still untapped by scientists. But much of that treasure is now threatened after the Trump administration shrank the monuments last December. Nearly 2 million acres of rocky land that once belonged to Bears Ears and Grand Staircase Escalante National Monuments, 2 million acres, now, once again, outside their protections, vulnerable to oil, gas, and uranium drilling, and like pages in a book, at risk of being ripped out of the record. That land is in limbo right now as the Department of the Interior takes comments on draft management plans, whether the territory is opened entirely to mineral and fuel extraction or protected somewhat from pillaging remains to be seen. But in the meantime, paleontologists like the archaeologists, environmentalists, and Native American tribes, who all have very vested interest in the monuments, everyone, everything, we’re all in limbo. 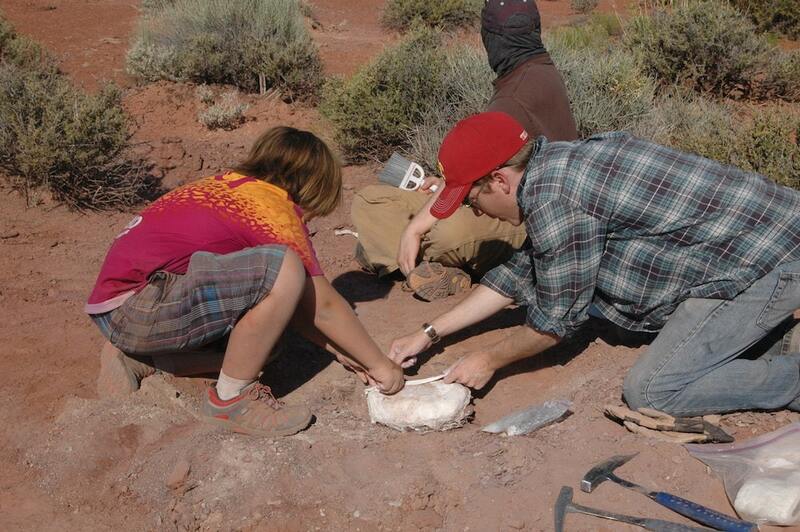 And here to explain the treasure trove of Utah’s fossil record and what might be at risk are my guests. Let me introduce them. Dr. David Polly, professor of paleontology at the University of Indiana at Bloomington and president of the Society of Vertebrate Paleontology, welcome to Science Friday. DAVID POLLY: Thanks for having me. IRA FLATOW: Dr. Stuart Sumida, professor of vertebrate paleontology at California State University, welcome to Science Friday. IRA FLATOW: And of course, shoutout to our listeners. Have you been to Grand Staircase or Bears Ears? Our number is 844-724-8255, 844-SCITALK, or you can tweet us @scifri. Let me ask you, David, give us the paleontologist’s eye view of these landmarks. What makes them so valuable to science? DAVID POLLY: Oh, there’s a couple of things. The two monuments are a little bit different in that Grand Staircase Escalante has a quite complete sequence of the Mesozoic era– which is commonly called the Age of Dinosaurs, though the oldest part of it is older than the dinosaurs themselves– and it’s been studied intensively as part of the national monument for 22 plus years now. It has completely revolutionized the way we think about the latter part of the era of dinosaurs. Bears Ears is geologically a bit older than that and covers some of the early life on land, and then sort of transitions up into the Mesozoic era. And it has not been as intensively studied partly because it’s relatively new as a national monument, but there have been bits and pieces of it studied for a long time and has probably the same potential as Grand Staircase for telling us new things about Earth’s history. IRA FLATOW: Let’s talk about some of those new things. Dr. Sumida, you worked out in the area– that was at least for a year– part of Bears Ears National Monument. What have you been digging up? STUART SUMIDA: Well, as David said, the kinds of animals that we find there are somewhat older than the dinosaurs. The rocks there that we’ve been exploring range back to as much as 16 million years before the earliest of the early dinosaurs, and those kinds of animals include the first animals that not only got out on the land but stayed out on the land. Animals came out on the land long before that, but they didn’t become independent of the water until about the time period represented in the southern part of Bears Ears. And this also includes a group called the synapses, which is the lineage that led to mammals like you and me. So we have a deep, deep history going down through Grand Staircase all the way down into the Bears Ears when it comes to our own lineage. DAVID POLLY: I was out there myself last week just about this time, and I want to note it’s also an incredibly beautiful park. STUART SUMIDA: It is a stunning, stunning area. 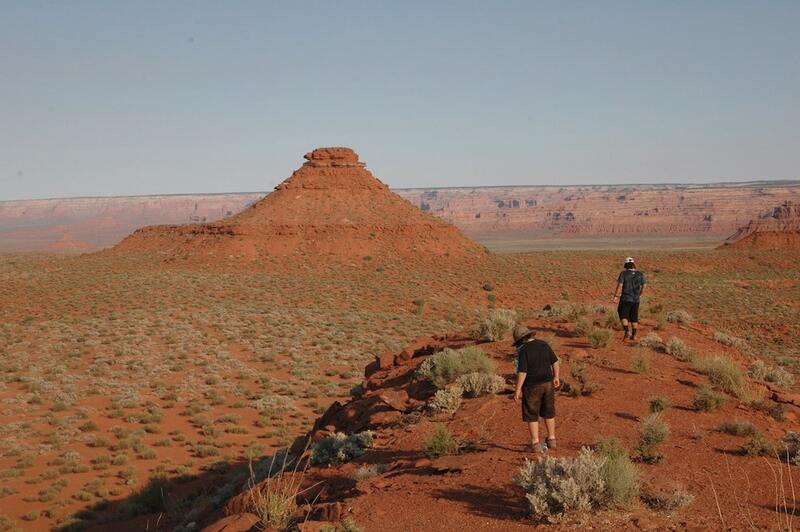 Most people are familiar with the areas just south of that, like Monument Valley. You can literally see Monument Valley from some of the southern edges of the Bears Ears National Monument designation, but those, of course, are tribal lands, belong to the Navajo Nation. IRA FLATOW: David, let’s dig in deeper about some of the most important fossils that have come out of these monuments so far and what remains there to be discovered. DAVID POLLY: It’s hard to put your finger on a most important fossil without going on for an hour or two. Some of the original fossils that led to the Grand Staircase being proclaimed a monument are not spectacular to look at, but they, too, are part of our own deep history as humans because they represent some of the earliest mammals. And some of the finds in what is now Grand Staircase are some of the intervals where mammals were first diversifying into what we now call placentals and marsupials. And Grand Staircase was the only place in the world that preserved some of those time intervals with fossils in it. And ironically, some of those sites for which the monument was created have now been excluded from the monument again. IRA FLATOW: Of course, there was a giant inland ocean there at some point in the history of North America. Might there be fishes and skeletons of those? DAVID POLLY: Yes. One of the extraordinary things about especially that late Cretaceous Sequence– the last part of the era of the dinosaurs– is that not only does it preserve a lot of dinosaurs, but it preserves all sorts of animals, and fishes, lizards, amphibians, mammals, birds, turtles, crocodiles. And it’s taught us a lot about how those ecosystems worked. IRA FLATOW: And Stuart, what do we understand differently because of the fossils found in Bears Ears? STUART SUMIDA: One of the things we’re understanding is how some of these changes took place. Fossils that we see in museums are often the most spectacular ones, which is a fine thing to do, of course, and they’re often the most complete. But when we bring the entire record together, what it’s telling is not only what was there, but how they adapted to different kinds of changes, how they finished getting out of the water and staying on the land, how they interacted with their environments. And this is not just anecdotal information. This is how we think about how we’re going to be interacting with our environments as we go forward. It’s all a part of a deep history that goes all the way up to today. IRA FLATOW: Let’s talk about what was cut, what was divided up. 85% percent in the case of Bears Ears got excluded. Is that correct? DAVID POLLY: I think that’s about the right number. IRA FLATOW: Tell us about that. DAVID POLLY: Do you want to do that, Stuart? STUART SUMIDA: Sure. Bears Ears was originally designated by the name of that particular rock formation that looks like a couple of bear’s ears, but that’s just a very small part of the entire monument. The monument stretches southward, almost to the border between Utah and Arizona. It was a very exciting time when we realized how much would be protected and preserved. But now, ironically, because it’s been unprotected, not only is it not being preserved in the way that we would have hoped, but it’s now had attention brought to it by people who didn’t know about it and people are going exploring looking to take advantage of it. It’s a sad irony, actually. IRA FLATOW: And what about Grand Staircase? How has that been divided up? DAVID POLLY: It’s been divided in a slightly more complex way. So what was a single monument, there’s now three smaller monuments inside of it and sort of chunks taken out on the north side and the south side, in some cases in the center. And using your analogy of pages of the book, some of the oldest parts of the Mesozoic history have been cut out almost entirely and some of the intervals in the younger part, in the last part of the Age of Dinosaurs, have been completely cut out. So for example, there’s one unit there called the Tropic Shale, which is a sort of black shale of the sort that shale gas exploration has done. And it’s one of the few units– and when I say “unit,” what I mean is bed of rocks– that’s from that ancient sea that you mentioned. And it has some really spectacular marine fossils, the things like the mosasaurs, which are sort of the dolphin-like reptiles or lizard-like reptiles that swam in the ancient seas. And it records a really interesting extinction event where the Earth’s seas were depleted of oxygen and caused a major extinction of some organisms and sort of arisal of new ones that replaced them. IRA FLATOW: So these are very, very important places to be preserved is what you’re saying. IRA FLATOW: And part that I was told is unprecedented in Grand Staircase is that it was taken actually out one part of it. A third part? One third of it has been taken out of the National Park Service? DAVID POLLY: Not the National Park Service, per se. All of it’s administered by the Bureau of Land Management, which is a separate agency within the Department of Interior. I think probably what you’re referring to– national monuments are automatically included in something called the National Conservation Land System, which is a sort of funding system within Department of Interior– and particularly the Bureau of Land Management– for preserving and developing the resources that need special conservation, and scientific things are one of those. So any of the parts of the monument that were excluded presumably in the future will not be eligible for that kind of money, and that means that a lot less research will be done there. IRA FLATOW: I’m going to bring on another guest now to talk about a lawsuit and the legal protection of scientific sites. John Ruple is a professor of natural resources law at the University of Utah. Welcome, Dr. Ruple. IRA FLATOW: I want to just– in full disclosure, all three of my guests are to some degree involved in the lawsuits to undo the cuts. And we did reach out to Interior Secretary Ryan Zinke to join us, but he did not take us up on our request or provide us with a statement. I just want to make sure we are clear about that. John, the lawsuits argue that the president does not have the authority to cut monuments even though he does have the authority under the Antiquities Act to create them. Why shouldn’t he be able to do both? JOHN RUPLE: The argument’s fairly straightforward. It’s essentially that the ability to create a monument is a one-way valve. If we step back and we think about the president’s authority, we have to ask where it comes from. And it has two possible sources, either the Constitution or a statute enacted by Congress. When we look at the Constitution, the property clause is very clear. It gives Congress the power over public lands and there’s no comparable grant of authority to the president in the Constitution. So when we look at what Congress has done, we start with the Antiquities Act. It’s the statute that allows the president to designate these national monuments. And nowhere in the statute nor in the congressional debate leading up to its passage was there a discussion of the ability to reduce or eliminate national monuments. So the question becomes, what does silence mean? Do we read that silence as empowering the president? And there are some problems with that. First of all, the Founding Fathers set up a constitutional structure that granted the power over public lands to Congress, and to read an implied power in that essentially upsets that balance is, I think, very disturbing to some of us that are concerned about the structure of our government. But when we step back and we look at what the Antiquities Act was designed to do– it was passed in 1996 because archaeological resources across the Southwest were under threat, they were being looted, they were being damaged. And Congress realized that it simply wasn’t nimble enough to identify all of these threatened sites, to designate them and come up with management protection, so it allowed the president to step in its shoes and fill that function, and to do so fairly quickly. So there was a need for the president to act quickly and unilaterally to protect landscapes. There was no comparable need to act quickly to undo them. So, there was no reason for Congress to give up this power. And if we look at what Congress has done on public lands writ large over the years, on multiple occasions they’ve given the president the power to protect other lands. Often when they do that, they have also given him the power to revise or undo those designations. They didn’t use that language in the Antiquities Act. That choice of language, I think, has to be interpreted as purposeful. The third reason I’d point to is that over the years, Congress has repeatedly taken up legislation that would empower the president to revise national monument boundaries. Every time it has, those bills have failed. Now, I think that tells us two things. One, it tells us that Congress was aware that the president lacked these powers, and two, that Congress was very reluctant to cede that authority. And finally, my fourth point is that in 1976, Congress passed FLPMA, the Federal Land Policy and Management Act, which is really the foundational law for public land management. In enacting that law, Congress repealed about 300 statutes that specifically dealt with the president’s authority over public land. So it’s very clear at that point in time Congress was trying to reassert its authority and rein in any expressed or implied authority the president may have over public lands. IRA FLATOW: I’m Ira Flatow. This is Science Friday from WNYC Studios. We’re talking about the national monuments in Utah and my guests are all experts on this subject. We have folks on the phone. Let’s see if I can get a call in, or two, before we go to the break. Let’s go to Isaac in Charleston, South Carolina. Hi, Isaac. ISAAC: Hey, thank you for taking my call. This is a really interesting discussion. ISAAC: So I’m a geologist. I’ve studied extensively throughout the Great Basin in central Nevada and did field studies in southern Utah. I do have a question regarding to the way that these parts were fragmented. It seems to be that, especially the one that was broken into three pieces, it was either very deliberate or it was just kind of like, cut here, cut there. Was it done because the people responsible for drawing the lines knew what sort of mineral deposits, or gas deposits, or anything with potential for mining or exploration is out there? What can we find? IRA FLATOW: Let me get an answer because we’re running out of time. John, have any insight to that? JOHN RUPLE: Yeah. The short answer is when both President Clinton and President Obama created the original monuments, they withdrew the land within those boundaries from future mineral development. When President Trump cut the boundaries, he opened most of that land to new applications for oil and gas development or for mineral mining. And there has been a lot of interest in coal within what was formerly the Grand Staircase, within uranium mining in Bears Ears, and with oil and gas across that region. If we look at the lawsuits, one of the points the plaintiffs made is that since 2013 oil and gas developers have submitted what are called expressions of interest on over 105,000 acres within Bears Ears. If we look back at it to March, the BLM sold oil and gas leases in southeastern Utah in over 51,000 acres of land. 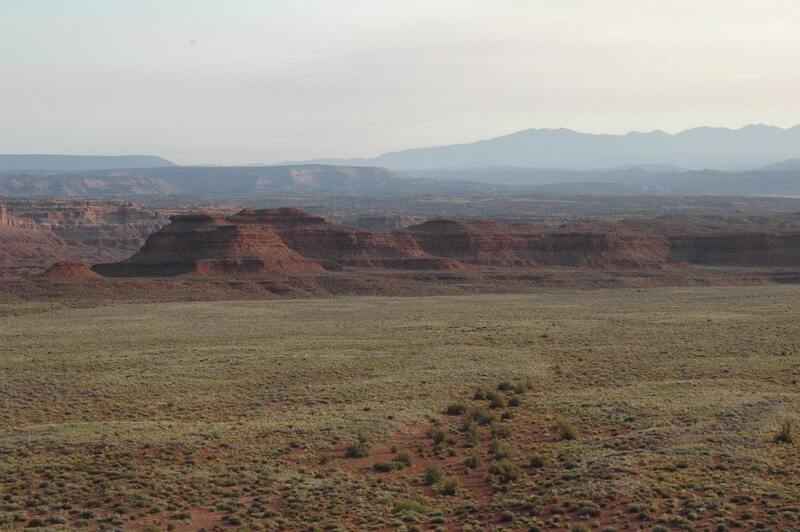 There’s a December lease sale coming up, again, in southeastern Utah near Bears Ears covering another 45,656 acres. So these are lands that are not necessarily within the Bears Ears national monument, but they’re very close, and I think they give us an idea of the interest in those lands. And the Washington Post, by the way, has done some excellent reporting on the connection between the oil and gas industry, and uranium industry, and these reductions. IRA FLATOW: All right, we’re going to come back and talk lots more about things– our number, 844-724-8255– with my guests David Polly, Stuart Sumida, and John Ruple. 844-724-8255. You can also tweet us @scifri. Stay with us. We’ll be right back. This is Science Friday. I’m Ira Flatow. We’re wrapping up our conversation about the future, present, and extremely distant past of the Grand Staircase and Bears Ears national monuments in Utah after the Trump administration scaled back their size, excluding nearly 2 million acres of land that’s rich with fossils and which paleontologists say could revolutionize our understanding of life on Earth. I have a couple of paleontologists with me as my guests today, David Polly, Stuart Sumida, and a law professor, John Ruple. Our number, 844-724-8255. You can also tweet us @scifri. Stuart, what is the practical effect for scientists of a national monument designation for this kind of land? STUART SUMIDA: Well, as David mentioned, different administrations of these kinds of lands then fall under different purviews. So proper scientists always document what they do and we are always permitted to do what we do. So even determining who’s in charge and whom you ask permission to do your work is enormously affected by the designation. As David said, there’s a difference between the Bureau of Land Management versus the kind of administration you have with national monument protection, and it also impacts whether or not we can simply afford to do it. Funding agencies and foundations are to borrow an economic phrase uncertain about what is going to happen. So they’re all a little bit reticent about whether or not they’re going to fund activity there because they don’t know what’s going to come of it. And it also makes getting volunteers to work with you somewhat more difficult. IRA FLATOW: Let me see if I can get a phone call in before we have to leave. Let’s go to John in Moab, Utah, right out there where it’s happening. Right in the room where it’s happening. John, welcome to Science Friday. JOHN: My comment is I’ve been operating my bicycle tours in the monument, both the Grand Staircase and the Bears Ears, for 20 years. And originally, when the Grand Staircase was designated, there was certainly a lot of concern as far as the economic benefits, if mineral extraction was going to be removed. Over the years, this has been a great boon to the communities of Escalante and Boulder Utah. Moving forward, the Bears Ears has somewhat a similar potential. But overall, taking people out there, exposing them to the monument and the history, they’re awestruck. This is certainly, in my opinion, as far as the removal and reduction of the size of the monument, it is about the mineral extraction, those players, the influence they have, it’s written on there, clearly. IRA FLATOW: David, the people really care about this in Utah, don’t they? DAVID POLLY: Yes, they do, and in both directions. There are a lot of people who are around there in Escalante, and Boulder, and some of the cities close to Grand Staircase, and those cities have really grown from the monument. And I can say that I know of at least 200 paleontologist who have visited there, and that’s just a fraction of the sort of people who visit. And the mineral resources were mentioned. With the exception of the coal, the mineral resources there, especially in Grand Staircase, are fairly marginal. In fact, some of the documents released by the Bureau of Land Management effectively said that the value of the land as a wilderness and as science, et cetera, seems to be much greater than it’s value for other things. IRA FLATOW: John Ruple, as someone who lives in the area and works there, I’m sure you have your own opinions about the value of your neighborhood. Do you know when any of the drilling might start in search for minerals out there? JOHN RUPLE: The ability to go out and start drilling for oil or natural gas, there’s a long permitting process that must begin. Some of those lands on the borders of Bears Ears have already been leased. We’re seeing some activity in that area, but there’s a long process that operators have to go through before they can begin drilling and producing oil and natural gas. So we’ll be watching closely to see if that activity encroaches on the monuments, but it’s too early to say when it will happen or exactly what it will look like. IRA FLATOW: Is there a public comment period? Or comment to Secretary Zinke about all of it? JOHN RUPLE: There is for the monument management plans, so both agencies– I should say, in the case of Bears Ears, it’s co-managed between US Forest Service and the BLM. At Grand Staircase, that’s managed by the BLM. Both agencies were directed by President Trump to develop management plans for what’s left of these two national monuments. They’re going through that process right now. They have provided a draft monument management plan, and environmental impact statement. The preferred alternative for both of those monuments calls for really minimizing restrictions on development of the land within the boundaries, and that’s in addition to reducing the protections on the lands that were cut from the monuments. But you can go online, you can review the draft monument management plans, and you can provide comments. I believe the comment deadline is November 15 for both of those. IRA FLATOW: All right. Thank you very much. That’s all the time we have. John Ruple is a professor of natural resources at the University of Utah. Dr. David Polly, professor of paleontology at Indiana State University of Bloomington and president of the Society of Vertebrate Paleontology. Dr. Stuart Sumida is professor of vertebrate paleontology at California State University. Read more about the paleontological repercussions of shrinking the national monuments. See an interactive map of President Trump’s changes to the national monuments. Learn more about how drilling rigs could pop up in the national monuments. Check out 100 photos of the cuts to Bears Ears National Monument. Do Instagram influencers attract too much attention to fragile outdoor locations?